Starting location: Braley Pond Recreation Area. From Staunton, VA go west on Rt. 250 17 miles. Turn right on Rt. 715. Go 1.1 miles and turn left at entrance to Braley Pond. 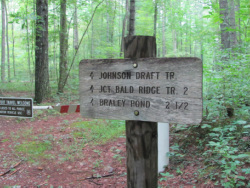 Description: The Johnson Draft Trail is a 2.5-mile loop trail from Braley Pond. After entering the road into the recreation area, you will come to a fork in the road. The picnic area is to your left. Bear right at the fork, and you will soon see a gate to your right and the trail behind it. Park anywhere along the road. On the trail, go past the gate and follow the yellow blazes along the old roadbed through forest and grassy openings. After approx. ¼ mile, you will see a sign for Braley Branch trail to your right (more about that trail below). Continue to the left as the trail becomes narrower and rocky in some places. After 1 mile, you will see a fork; bear left into the woods. Follow trail through the wooded area and across several small streams (usually dry from mid-summer to fall). The trail will emerge onto another old road. Turn left and follow it back to Braley Pond. (Note: if you took a right on this road, after a short distance you would see a trail to the right. This is Bald Ridge Trail, which ascends Shenandoah Mountain to the edge of Ramsey's Draft Wilderness Area; see maps for more info.) When you arrive at the pond, there is a trail on either side of the pond to return to the picnic area. A shorter trail option for families with young children is also available. Start out at the same trailhead described above, but turn right at the sign for Braley Branch Trail. You will ascend a small mountain on a grassy trail, and take a right near the top into the woods. The trail is easy to follow and dips through mature forest. After ½ mile the trail will descend and become grassy, emerging onto the road you drove in on. Turn right onto this road to return to your vehicle. The Braley Branch Trail loop is only one mile. The trails are well-marked and there are signs leading the way. Both trails are open to horses and bikes. Why we like it:Braley Pond is in a beautiful setting tucked away at the base of Shenandoah Mountain, yet is easily accessible from Rt. 250. The Recreation Area offers a smorgasbord of family activities such as picnicking (tables and grills provided), a beautiful pond and stream for fishing and wading, and access to multiple trails. The pond is surrounded by upland forest and riparian woodland. The two short trail options are great for children and beginners. The pond is alive with wildlife. It is stocked with rainbow trout, and largemouth bass, bluegill, and catfish thrive here. Newts, frogs, and unusual damselflies and dragonflies can be seen at the pond, as well as eastern box turtles. This is a popular location for birding; great-horned owls and pileated woodpeckers are permanent residents of the area. See the Virginia Birding and Wildlife Trail page for more information. The picnic area is vehicle-accessible, but you must ascend a fairly long set of stairs over an earthen dam to see the pond. During wet/rainy seasons, the trails may be muddy. Take care of our trails by refraining from biking and horse-back riding on muddy trails.